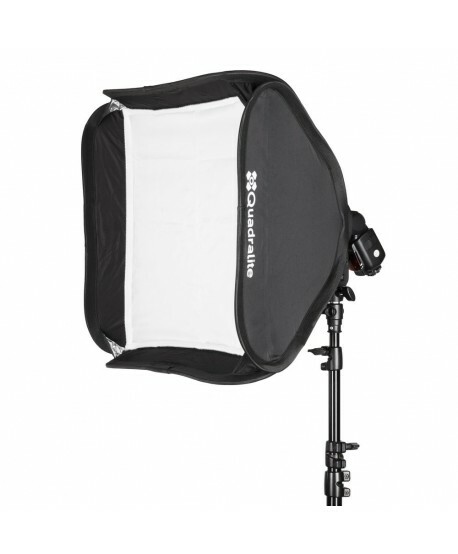 Quadralite Flex Foldable Beauty-Dish is a light modifier which combines features of a foldable softbox and a beauty dish. Quadralite Flex Foldable Beauty-Dish is a versatile light modifier that combines portability, lightweight construction and high quality materials. It can be use as a beauty-dish to deliver a dramatic lighting effect ideal for portrait, beauty and fashion photography. However it can be also transformed into a softbox to achieve soft and diffused light wrapping effect on the subject. Quadralite Flex Foldable Beauty-Dish is built on the basis of a quick folding mechanism, therefore it is easy to use and can be prepared for work in a few seconds. One of the biggest disadvantages of a metal beauty-dish is its stiffness and bulkiness. It cannot be folded down into a bag and is hard to carry around and store. Quadralite Flex Foldable Beauty-Dish is designed to deal with these problems. It is light, small when folded and easy to carry inside the supplied bag. Detachable center diffusion disc is the main reason why this outstanding light modifier is so versatile. This disc is suspended directly above the light source and is working as a deflector that channels the light onto a reflective surface of the shell. In this setup Flex Foldable Beauty-Dish is working just like a traditional metal beauty-dish but without its major drawbacks. However it can be transformed into a full-fledged softbox in a matter of seconds. Thanks to its spherical profile this light modifier is extremely efficient and portable. Especially in tight spaces, rooms and corridors it delivers the light exactly where you want it. If necessary, it can also be used with a grid (available separately) for better light control. Flex Foldable Beauty-Dish is based on 8-shaft octagonal frame construction, which provides appealing circular catchlights in the subject's eyes. Outer shell is made from high quality rip-stop nylon fabric for high durability, long lifespan and small weight. Interior is laminated with highly reflective silver film for even light distribution across its surface. There are two layers of diffusers made from high quality polyester fabric. This part was carefully picked and tested to ensures proper white balance and color rendition. Main part of the frame is made of metal. Steel tension rods support the whole structure effectively and keep spherical shape despite lamp tilt. Mount and deflector are made of aluminum. Flex Foldable Beauty-Dish is equipped with widely used Bowens-type mount, which ensures compatibility with a wide range of studio and on-location lights available on the market. Thanks to separately available adapters it can also be used with Broncolor, Profoto and Elinchrome flashes.